Natures Menu Junior Chicken and Turkey is a complete and balanced meal for puppies from 8 weeks of age. Made from whole cuts of Chicken, Turkey and nutritious herbs, it will certainly satisfy your little pooch. Containing a high content of real meat and no meat derivatives or meat meals. 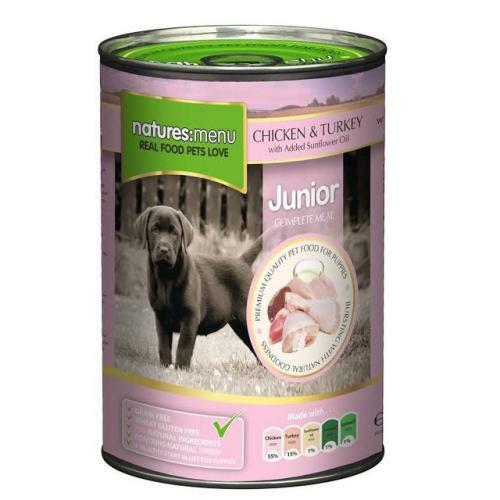 Natures Menu Junior Chicken and Turkey makes for a top quality, nutritious and digestible meal for your growing puppy. All Natures Menu cans are packed with the finest ingredients and steam cooked to ensure all the nutrients and goodness stay within the product. Chicken and Turkey are superb lean proteins, rich in natural fatty acids and calming amino acids, all vital for your fast growing puppy. The added seaweed, spinach and anti-oxidants also support your puppy’s growth and well-being. •	Containing 70% real meat and no meat-derivatives! •	Steam cooked in the can – all the goodness is locked in. •	Great source of protein. •	The next best thing to a raw diet. Perfect for a growing puppy. •	Suitable for puppies from 8 weeks of age. Lamb (min 30%), Chicken (min 29%), Carrots (min 6%), Peas (min 4%), Rice (min 4%), Sunfl ower oil (<1%).